The prick of a pin or a touch from a loved one and countless other such sensations come alive for us as a result of communication between billions of interconnected neurons. The neurons in our nervous system form precise circuits akin to modern computing devices, albeit a few thousand times more complicated. These circuits dictate our daily sleeping and eating habits, how we interact with our physical and social environments, and even how we demonstrate our emotions. The basic pattern of circuit organisation and their corresponding functions are conserved across genus and species. If and when these networks go awry, our basic capabilities falter, relationships deteriorate, the quality of life and its expectancy diminish. Some newer technologies have made it possible to identify and dissect behaviour-specific neural circuits. For example, optogenetics allows for activation or repression of specific subgroups of neurons through targeted expression of genetically altered rhodopsins, which respond to light of different wavelengths. 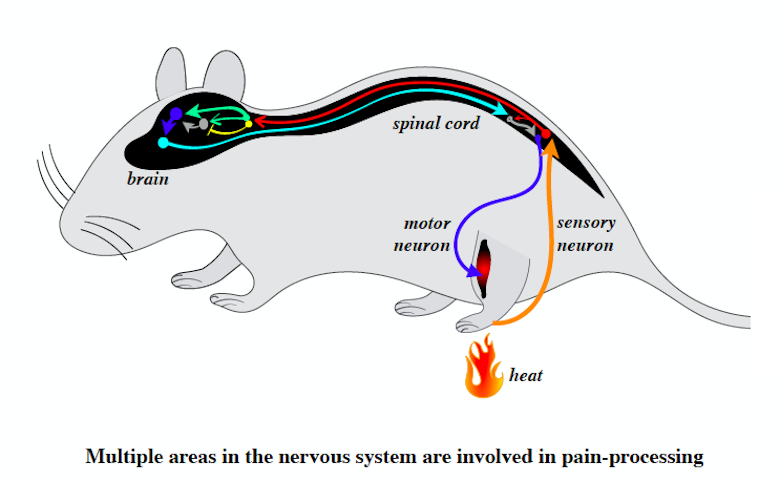 Using this technique, it is possible to activate pain-related neural pathways and create the sensation of pain in the absence of any external painful stimuli. This ability to manipulate specific groups of neurons has afforded the opportunity to identify neural networks that mediate specific behaviours. Another innovative way of identifying novel circuits is through viral-mediated tracing of inter-connected neural networks. For example, the rabies virus can be modified such that when it is introduced into the nervous system targeted to a specific group of cells, it does not cause rabies any more, but can jump synapses and deliver genes of interest to neurons that are pre-synaptic to the target neurons. Complementing these efforts are advances in microscopy and immuno-histochemistry, which have allowed scientists to generate three-dimensional maps of developing neurons in human embryos at microscopic resolution. Together, individuals from scientific background as diverse as molecular genetics to chemistry to electronics are joining hands to develop newer and ever better ways of interrogating the nervous system in ways that were previously unimaginable. There’s excitement galore. Significant investments by Howard Hughes Medical Institute (HHMI), National Institutes of Health (NIH), Max Planck Institute, Allen Brain Institute, and others have propelled the study of circuit neuroscience at an accelerating pace. Silicon Valley giants like Google and its parent company, Alphabet, are investing heavily in neural computation and artificial intelligence. Facebook’s Mark Zuckerberg and Priscilla Chan recently created the Chan-Zuckerberg initiative with a mandate of basic neuroscience research. Apart from the west, Japan and China have also made significant contributions in this revolution. China launched “China Brain Project” in 2016, a 15-year initiative to understand the neural basis of cognitive function. India’s Department of Science and Technology (DST) launched the Cognitive Science Research Initiative (CSRI) to fund basic neuroscience research in May, 2017. Research in this cutting edge area of science is yet to gain momentum in the country. As India seeks to forward its own scientific enterprise, this is a discipline that cannot not be ignored. Given the existing expertise in mathematics, statistics, computer science, chemistry, and wealth of natural resources, India can potentially carve a unique niche. For example, India can leverage its expertise in computational technologies to develop tools to study/analyse data generated in studying neural circuits. While recording the activity of neurons in mice, fish, flies, and monkeys over days, biologists generate huge amounts of data, often to the tune of hundreds of terabytes. Organising, analysing, and cataloguing this data in meaningful ways requires extensive computational power and expertise, which biologists performing the experiments often lack. Development of freely available software with user-friendly graphical interfaces is the need of the hour. Increasingly, a lot of such datasets are becoming publicly available. Which creates an opportunity for mathematicians and computational biologists to look for unique or unifying patterns underlying the data. Most of our understanding of the fine structural details of neurons and glia in the nervous system come from observations of neural tissue under microscopes that provide nanometer-scale resolutions. Since high-end commercial systems are prohibitively expensive for countries or institutes with proportionally smaller scientific budgets, such a disadvantage necessitates the development of indigenously built systems that can democratise modern neuroscience. Studies over the past decade have deciphered circuits with unique molecular signatures responsible for regulation of sleep, satiety, taste, chronic pain, and memory. In order to manipulate those circuits in patients with neurological disorders, one needs to develop drugs or strategies to uniquely target these circuits. India with her wealth of bio-resources and expertise in chemistry can foray into developing compounds targeting these circuits. Apart from improving access to technologies, biological questions of interest pertinent to India can be researched. For example, neurological disorders associated with viral infections endemic to the subcontinent or the possibilities of intellectual shortcomings due to chronic malnutrition can be investigated at the cellular and molecular level. Most importantly however, there is an urgent need of disseminating the developments in modern neuroscience to the general public. In particular students at an early age should be exposed to the possibilities these developments hold for them.